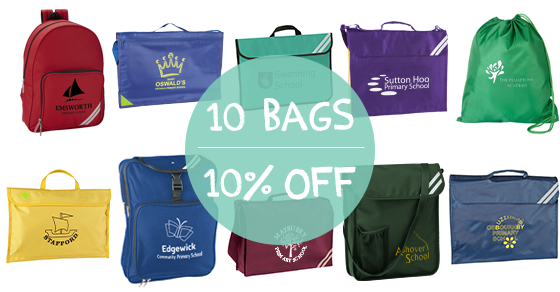 Schools - Looking to introduce printed or embroidered bags? Take advantage of our Early Bird offer this Jan and Feb and get 10% off. School Trends have a wide range of great quality school bags. Whatever your requirements our bags are so versatile, from a lightweight, easy to carry Back Pack for reception starters, a Book Bag for reading books and letters home to a Portrait or Despatch Bag with ample storage for your year 6 pupils. Give our Customer Support team a call on 0114 2512501 to find out more about this great offer! Printed bag orders can be made up across the 10 styles of bags to achieve the required minimum order quantity of 25+, 50+ or 100+. Printed cap quantities can be made up of both baseball and legionnaires caps. Embroidered bag orders can be made up across the 8 styles of bags to achieve the required minimum order quantity of 25+, 50+ or 100+. This offer is not available for parent orders as a minimum of 25 bags is required. The Early Bird offer cannot be used in conjunction with any of our other offers.